This innovative beer gift couples the simplicity of a longneck bottle with the elegance of a high-quality pint glass. Thick, hand-blown glass with dual-wall technology is precisely crafted to keep the beer chilled inside the glass, while keeping the outside of the glass warm and condensation-free. The recipient's initials personalized on the exterior of the glass will make it a truly unforgettable gift. 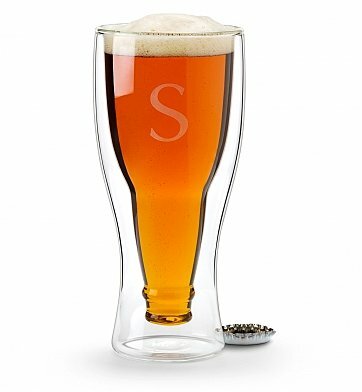 The ergonomic design, unique appearance and personalized nature of the glass make it a practical keepsake that feels great in the hand and looks stylish at the wet bar - sure to impress any beer enthusiast. One Hopside Down® Beer Glass. Complimentary Monogrammed Initial on Glass's Surface. Gift arrives presentation-ready in our GiftTree signature gift box. A complimentary card with your personal greeting or message is included with your gift. Free Engraving! One single monogrammed inital. Enter information to be engraved using the personalization option during checkout. Measures 4" x 4" x 9". Personalized Hopside Down® Beer Glass is a hand delivered gift. These gifts are delivered by one of our local design centers located throughout the United States and Canada. Same day delivery is available for most gifts when ordered before the cutoff time. The cutoff time for Personalized Hopside Down® Beer Glass is 2 PM in the recipient's time zone. Thick, hand-blown glass, precisely crafted to hold 12 ounces. Complimentary monogram of your chosen initial. Arrives presentation-ready in GiftTree signature gift box. Everyone wanted this glass in our gift exchange. I had to reorder so I could get an initial on the glass. I received it in 2 days. Thank you GiftTree to inspire me for the gift to my husband. It was great time for us even we are on different continents. Glass was nice. I'm looking for the next gift soon. Bought this twice now as a gift and the recipient loved it. Bought as a gift for my brother, LOVE it, just might have get one for me! The shipping was great arrived in just a few days without paying for the quick shipping! Will buy from GiftTree again!!! Great gift, good value! GiftTree always has such a wonderful variety of gifts at all price points. This was a gift to a long, lost Army buddy who found me after 50 years that we served together. He was just delighted by this perfect beer glass. I bought this for my husband as part of an anniversary gift. He absolutely loved it! It's so different, good quality and the personalization adds even more to the special gift. My husband loved his Father's Day gift! This was a gift so I did not see it in person as it was sent directly. All I can tell you is that the person loved it and I can always find great gifts that are also great values. Sent this to my sister for her birthday, and she loved it! I think it is a great gift idea! Will for sure send to others in the future! I am going to pick up a few for myself as well! I sent this to a beer drinking friend who just lost her father. She absolutely loved it and said her dad loved his beer so it would be a great memory of him every time she used it. Very nice and affordable gift! It was a gift for my daughter who is studying culinary at CIA, she loved it, she received it on time. She said it is original, and she loved her initial printed on the glass. I recommend it.